I’ve had a tremendous zucchini harvest this year. For the past four weeks or so, I’ve been harvesting this many zucchini every few days. I’ve been using them in any way that I can. I chop them up and throw them into any and everything that I’m cooking, I eat them raw in salads, and have even shared a post on 20+ nourishing zucchini recipes, some of which I’ve made. 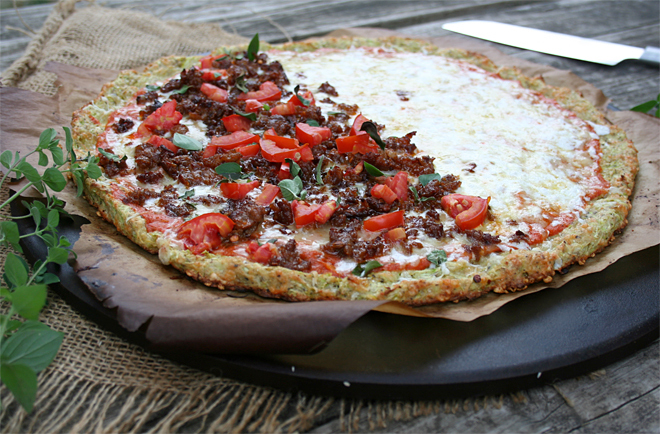 I was honestly just about done with zucchini, until I heard about a zucchini crust pizza. It sounded like an amazing way to use up my harvest. When I made it, it was good; however, the crust was too soft and quiche like for my tasting. It had to be eaten with a fork. I wanted a pizza crust that would withstand a lot of toppings and that I could pick up with my hands. So, I revamped the process of cooking it and…voila. The secret to the beautiful golden crust on the bottom is to bake it on a pre-heated baking stone at a high temperature of 550F. This process is essential to avoid a soggy, eggy crust. It’s exactly the same process of how I bake my regular pizza, but I don’t have to wait for dough to rise. It’s brilliant! After the crust is pre-baked all you need to do is top it with your favorite toppings and bake it on the preheated baking stone in the oven for a few more minutes. It’s so simple and quick to make. After developing this recipe, I think I’ll have to double the zucchini plants I grow next year. Yeah, it’s that good. One thing to remember, the season is winding down. If you like this recipe, I’d like to encourage you to stock up on zucchini soon to to freeze and preserve for the winter ahead. All you need to do is shred the zucchini into 8 cup portions and freeze it. Also, this crust can be made gluten free by substituting the flour for rolled oat flour. The best zucchini recipe ever - zucchini crust pizza. It's super simple to make and tastes simply scrumptious! Have you ever made zucchini crust pizza? Share with me in the comments below any other pizza crust ideas I should know about! I. Love. You. That is all. Wonder if it would be good to eat like bread sticks dipped in pizza sauce? If it can hold toppings, surely on its own it is dippable, right? I omitted the cheese, dehydrated the zucchini the put it in the blender, made zucchini flour. just add herbs and water and bake as normal crust. nice and crispy. Really great for my vegan friends. Hi there, can you please let us know exactly how you made this? Sounds amazing! How much water, etc. Thanks! Can you please explain the steps you took to change it up? Thanks! Oops! I meant that the question is addressed to Cristo! I want to know how she made this in a step by step process. Thanks! Please share with us how you did this Cristo! Diana Bauman, did Cristo leave a comment notification? You can also use vegan cheese. My son is vegan and we know you don’t need to say goodbye to cheese just because you choose to eat differently. I am wondering I am on low carb high fat diet do you know how know how many carbs are in zucchini pizza? Hi there. The most of the cards will probably come from the tomatoes in the sauce. But use whatever tomatoes you would use with your diet. Zucchini is one of the favorites of low carb diets, the cheese will definitely be your fat with no to little carbs. Also substituting it with the almond flour is a must for you if you try this. But I think this would be great for someone on Keto or any other like it. You could make a zucchini cheesy bread….it is out of this world!!!! Did you try it with a pizza stone at lower temp. I though parchment paper was typically only safe to 425 or 450F and typically use 400 to 425 for my crusts. What if my oven doesn’t go to 550?? is 499 ok? Once I hit 500, it shuts off. Fickle thing! Yes, it will work fine at 499F. Just use the highest setting you have and make sure the top of the crust is starting to brown when you first bake it. I will use the grill!!! who wants to heat the house?? Loved the flavor of this but the pizza crust baked onto the parchment. Had to scrape it off into a messy pile on the plate. Glad I was only serving to hubby. Perhaps a tip to spray the parchment for is first timers? What kind of parchment paper where you using Faith? I’ve never had anything stick to my parchment paper before. My bad! I retract my statement!! Upon looking at my parchment paper, it was in fact wax paper! No wonder it didn’t work. Oh boy….anyway, I still loved the flavor and have passed this recipe on to numerous people, as well as linked them to your site! Keep up the good work, and sorry about that mistake. I did the exact same thing, Faith. Pizza was wonderful, but stuck like crazy. I also had this happen to me !! I pealed off and spread on pan I sprayed but still couldn’t get it crispy enough to pick up ..I wish it was more like pizza that I could pick up instead I had to eat with fork !! Great taste though ! I made pizza tonight using this crust recipe, and we loved it!! I don’t have a pizza stone, so I used tin foil, and left the crust baking a few minutes longer. It was softer on the bottom, but we could still hold it like a regular slice of pizza. PK. next time you are at the grocery store, check out their close-out section. That is where I got mine (for 10 bucks!) and I also saw some in the close-out section of another grocery store near us. Maybe it is just my area, but it is worth a look. Not a lot of Pizza Makers in Houston, I guess. Good Luck. Be careful with that. Ceramic floor tiles are not cured the same way and sometimes still contain moisture. I tried the same thing a few years ago and luckily was cooking with it on the grill with the lid down. The tile exploded like a bomb went off sending tiny pieces everywhere. Gigi, I’ve ended up swapping out the almond flour for oat flour. Works great! Dang. Just spent an hour driving to kitchen store for pizza stone, then to grocery for other supplies, have heated stone, grated zucchini…..and now realize I have no cheddar :-(. I wonder if a mix of four cheeses plus some parmesan would work?? If you want to freeze zucchini, would you salt and drain it first, then freeze? or just shred and then salt/drain after thawing? I froze 80 (!) cups of shredded zucchini in 10 servings last summer in anticipation of making this pizza. I just now did and am floored how yummy it is. I just defrosted the zucchini, drained and then did the salt squeeze process. Worked great. Thanks for a great recipe Diana! I am going to try this weekend. What is your recommended way to shred the zucchini? Also, would two large zucchinis make about 8 cups shredded? Finally, could I use 1 cup shredded mozzarella cheese in the crust instead of cheddar? Thanks so much!! This looks amazing! Thinking of making it tonight for dinner 🙂 Quick question tho, is the cheese really necessary for the crust? Is it just used as a binding agent? Any suggestions for substitutions? Thanks!!! I’d like to know as well if it’s a binding ingredient or for taste since cheddar is hard on the Crohn’s tum. I am guessing that the garlic is for taste so I can omit; yes? It looks delicious! Allie and Lydia, yes, the cheese is for flavor and binding. I was thinking maybe use some flax and water….for like eggs as a binder. It would be goey and thick..and hold well but still not be the cheese and the flax is neutral flavored….add some paprika and maybe some chili powder to put back some of the flavor or ?????? Hi, for the dairy free peeps: I have used a cheese substitute I get at Whole Foods made with Almond milk that is rather nice. That might work, or a pinch of xanthan gum or guar gum, to help bind. Can’t wait to experiment with this for my gluten free family. Thanks, Diana! I`m wondering, is coconut flour will work in the crust? What do you think? I used to make this for years. One important thing tho & I don’t see it mentioned is that the zucchini needs to be really squeezed after grated to get the water out to prevent having a soggy crust. That is all. never going to do any other kind of pizza anymore! I’m so glad you enjoyed it Anu-Leena! Enjoy!! What a brilliant idea! I will be trying this as soon as my garden begins producing zucchini. Thank for the recipe! Hi Diana! This looks amazing! I was wondering if I could use corn flour instead of wheat flour since I’m looking for a gluten free crust. Is the 8 cups before after after draining the water out? Very interesting recipe. I will have to try it. But I do something different and call it Zucchini Pizza. I take a large pie plate and slice the zucchini thinly and place a thick layer of the slices in the pie plate. I top that with pizza sauce, spaghetti, or marinara sauce. I then add pizza toppings (the more the better) and finish with a thick layer of pizza cheese. I bake it at 400 degrees until the cheese is brown and bubbly. It can’t be eaten with your fingers, but it is simply delicious! Have you tried making zuchinni pancakes? I’m glad to hear that, Cyn! I had taken a Cauliflower pizza crust recipe, and an Almond flour recipe, merged/combined the two, and came up with a hand holdable pizza crust. Looks like your recipe, I just came across (FB) is so very nearly identical, even to the wringing out the water from the cooked riced cauliflower before mixing it with the eggs, cheese, and almond flour. Great minds …Blessings! Yes! We’ve been trying to make a pizza crust that’s actually crispy and now we’ve got it! Thanks so much! We were in the mood for Mexican so we added chili powder, cumin, and cayenne to the crust instead of Italian seasonings. We topped half of it with seasoned ground beef (for the hubby) and the other half with refried black beans (for me). After it came out of the oven, we added fresh toppings like salsa, tomatoes, avocado, and sour cream. Holy moly! Freakin’ awesome!!! Is crost could be made and frozen? I was thinking if making a few, letting the cool, then freezing so I can just thaw them and make a pizza anytime. Yes you can make ahead and freeze them. I warmed one up today. I let it thaw on the counter and then topped crust. I then put it in the oven directly on the oven rack. It cooked up great! I can’t wait to try this recipe. I was wondering if the crusts could be made (when the zuchinni is plentiful) and freeze them for later use. Susan, I’ve never tried that, but I don’t see why not. That’s a fantastic idea! This recipe will be such a lifesaver for all that zucchini out there right now! I saw the post above that the cheese is for both flavor and a binding agent. For those who are dairy free, what could we use for binding other than cheese? A little nutritional yeast might work to add back the flavor but would the crust hold together without the cheese? Marla, unfortunately, I haven’t tried a dairy free version so I can’t really recommend anything. Maybe someone else reading this thread may have an idea?? How about nutritional yeast for a cheese flavour? I made a crust the other day and forgot the cheese and it turned out great. It held together just fine. Good to know! Thanks, Jessie! When you say 8 cups of zucchini, is that before it is wrung out of water or after? Thank you. I can’t wait to try this recipe. Sounds way easier than using cauliflower. I Could even add some finely chopped fresh spinach to it too. Will this work without a pizza stone?? Someone else reported using heavy duty tin foil instead of a pizza stone. She liked the results but hoped Santa would bring her a pizza stone. I may try that myself! I used a cast iron pan. Came out great!! No pizza stone.. head to your home improvement store and pick up unglazed quarry tiles. Super cheap and they work. Just make sure they are unglazed. I was just eating a zucchini pizza, which happens to be my favorite pizza flavor, then I thought, do people eat zucchini pizzas in other countries? So I googled it and came straight to your blog, only to find that you use the zucchini in the dough (wow! That’s gotta be delicious! ), whereas we use it as a topping. Pretty much all pizza places in Brazil have Zucchini pizza in their menu. The toppings are normally Zucchini, cheese and dehydrated garlic granules. But I’ve heard of a zucchini-eggplant-shitake-cheese-garlic pizza. Do you guys have zucchini pizza (with zucchini as a topping) in the US or back in Spain? I made this last night with these changes- I halved the recipe, used half brown rice flour, and used a cast iron ‘tortilla’ pan instead of a pizza stone. I topped it with goat cheese, figs, roasted garlic and caramelized onions, a few basil leaves and a drizzle of walnut oil. (the garlic and onions I made in the crock pot) it was fantastic! I’m going to play around with the recipe and see if I can make a sort of flatbread with it on the tortilla pan on the stove. have to remember this recipe when cooler weather comes. it was way too hot to have the oven on that high last night but it was so worth it. Great recipe and great tip on freezing the season-end zucchini supply! Question for you on freezing shredded zucchini–do you squeeze out the liquid first or just shred and add to freezer container? Can the zucchini pizza crust be frozen after the first bake? We love zucchini pizza crust. Have made it for years from Molly Katzen’s recipe in The New Moosewood Cookbook. Last month we made single sizes, and froze the baked crusts and sent them off with our college student to make into quick pizzas later. Two must dos: 1- it’s really important to have a rimmed pan to catch any remaining juice. no matter how much draining, it can still leak more juice in the pan. Looking forward to trying the ring-it-out-in-a-towel technique. Sometimes we’ve just added more brown rice flour (gluten-free option) to soak it up. 2- parchment paper is an absolute MUST. Be sure to lightly grease the pan underneath the parchment paper so it doesn’t slide off the pan when you’re taking it out of the oven! (been there, done that) Also, be sure to save the zucchini “water” for a later soup. This is the BEST pizza I have ever eaten bar none. I love doughy rich pizza but this takes the cake. I’ve made it twice in the last week and cannot get enough. My husband does not eat vegetables. I didn’t tell him what this was made of and he gobbled it up and had seconds!!! I told him afterward what it was made of and he was in shock!! Thank you thank you thank you for this recipe!!! I made the crust topped it with the homemade tomato sauce recipe then cheese and taco meet. Cooked it all then added fresh tomatoes and green onions. Sooooooooooo good!!!! I love it! Thanks for sharing that with us, Anika! Do you know how long the tomato sauce will last? Would it be ok to freeze half and save for later? I want to make a big batch and save some for future use! Why can I NOT make a zucchini crust. This was my 3rd attempt with another epic fail – and my husband won’t even eat it. He was already upset when I began making it stating that he wanted a REAL crust. I thought for sure this was going to be a winner with the pictures and reviews. I do not have a stone, but I have a metal pizza pan. I also did not have parchment paper, so I cooked it directly on the metal pizza pan. Other then that followed the recipe to a T and have a very mushy nasty mess on my hands. Very disappointed that I cannot figure this zucchini crust dilemma out. Hi, Nicole. I have a question, are you placing the crust on a pre heated pan? Is the pan hot? Cooked this tonight for dinner. So delicious!! Do you have a dairy-free version? I was searching through Pinterest for something new to add to my recipe box and just found you. Thank you, thank for a wonderful new recipe. I will have fun with this one. DO NOT!!!! LEAVE THE PIZZA STONE IN THE OVEN WHEN YOU CLEAN YOUR SELF CLEANING OVEN!!!!! I did that. Once. IT CAME OUT LOOKING BRAND NEW AND I HAD TO “RE-SEASON”IT ALL OVER AGAIN!!! What is the nutritional info. I just made this….excellent taste….came out perfect. But I need calories. Vaya, que pizza, Amleto! Lo voy a intentar a tu manera. No he pensado en ponerlo berenjena. Que idea genial! I would like to thank you for this fantastic recipe. I am making it for dinner tonight. How much calorie would you say this crust has? I also have a nice sized organic garden too. I will have to come back to your website. Veronika, I’m not sure how many calories it has. Sorry. Looking forward to trying this …do you peel your zucchini first? Is the basil in the crust recipe fresh or dried? I have lots of fresh but am almost out of dried. Beth, you can use either. I believe in this recipe it’s dried. Good recipe BUT YOU JUST PAM THE PARCHEMENT BEFORE LAYING ON THE CRUST or else you’ll be stuck picking it off in shreds like me. Also, thinner than a half inch, not by much but a bit less is better. That you hadn,t to touch any basil and zucchini for zucchini.But just the topping ,is there?is preferably going to match with pizza and etc! This turned out amazing!! Thank you so much for this recipe. My husband and I are on a low-carb, high fat diet and pizza is one of my favorite things. Now I can eat it!! I’ll be shredding and freezing the zucchini out of my garden so we can have this all winter. Thanks again!! I saw this on Pinterest and decided to try it. I used whole wheat flour in the crust. Didn’t have parchment paper so I used aluminum foil to bake it on and then transferred it to the pizza stone. I’d like to try spraying the tin foil with cooking oil and then sprinkle cornmeal on it before packing down the zucchini mixture. Was delicious! Oh My Word! This is delicious! My daughters ages 11 & 13 even loved it and they don’t even like zucchini. I messed up by not straining the zucchini first and it still turned out albeit not as firm of crust as pictured. This recipe is a keeper! Thank you so much! I’m glad to hear that, Cathy! This came out GREAT. Thanks! Do you have to add flour? For the cauliflower crust, there is no flour. Zucchini is easier, coming right out of the garden. I made his tonight using almond flour, and although it didn’t turn out as crisp as I would like, the flavor was really good & I’ll probably try again. I pre-heated my stone to 500 because that’s as high as my oven will go, and i squeezed out he zucchini as good as I could, but I will try more squeezing next time and maybe change towels and try again. Has anyone else had crisp results with almond flour? Thanks for this recipe! I’m glad you enjoyed it, Emily. I haven’t tried with almond flour but hopefully, someone else can chime in! Just a handy hint for getting your grated zucchini really dry – I grate mine into a salad spinner and spin away!!! You lose a tiny bit down the sink, but I find it a lot les messy than squeezing out in a tea towel. I do this when I am making zucchini slice, but am giving the zucchini pizza a go today – sounds delicious!! What a great tip!! Thanks, Jacqui! I used Italian blend for the cheese and garbanzo bean flour and it came out great! I sauté veggies in a balsamic glaze and added once the crust browned. Once I took it out of the oven added arugula for a nice crunch. It was fantastic! Made this last night and it was delicious! Thinking of pre-making smaller crusts and freezing. What a fantastic recipe. Thanks for sharing! No problem, I’m glad you enjoyed it! I read and tried your recipe yesterday, OMG! We have been on a low carb diet for a while and have been missing pizza. We just re heated the left overs with smiles on our faces. This will be done again and again, it was wonderful. I made it this past weekend…….. absolutely awesome. I substituted the parmesan instead of Cheddar and coconut instead of olive oil, and 1 cup of Almond Flour. Even my hubby thought it was really good 🙂 Thanks for sharing! Awesome! Thanks for sharing, Laura! did you seed your tomatoes? Can a regular cookie sheet be used for the crust is I heat it up? I don’t have a pizza stone. This may be a ridiculous question, but do you cook the zucchini before shredding it? If so, how should it be prepared? No, the zucchini is raw. I ground up organic stone ground oats instead of flour, and used much less cheese. Lovely. thank you so much for this!!! I am going very low carb . . . . and am very happy about this!! will definitely be doing it as I have TONS of zucchini in my garden!! Can you use zucchini and yellow squash together? Thank you,Diana for a great recipe. We had been making this pizza for a couple of years and it’s delicious. We also made it gluten free,with a rice flour and almond flour and the crust was still nice and crispy. We made this pizza with different toppings and it was always delicious. We love it! Thank you! Thanks for this! It turned out great! Mine did stick to the parchment paper. I ended up flipping the crust over onto a cutting board after it cooled off and carefully peeling off the parchment. Then I sprayed the pizza pan with olive oil and returned the crust to the pan. That was easier than trying to get the pizza unstuck from the parchment after it was already baked with the toppings on. Next time, I think I think I’ll try oiling the parchment. I also baked it at 450 degrees because I was afraid of the parchment burning. It still worked and took just the 8 min. I just made this recipe tonight. I didn’t want to take the time to shred everything by hand and my food processor is broken at the moment, so I used my juicer so I could have as much of the liquid removed from the pulp as possible. This seemed to work well…I just picked out any tough pieces of skin and large seeds and followed the recipe the rest of the way. This crust is SO good. Amazing!! We drank some of the juice, but saved the rest (they produced a LOT of juice) to use in soups. I’m just joking with you! This is an incredibly delicious zucchini recipe. Thanks for sharing it with the internet! This is going to be my go-to crust whenever I get a pizza craving. This crust held up pretty well. Thank you for the recipe! A tip, don’t go heavy on the toppings! The crust did not fall apart, but it was too soft to hold. It just flopped over and toppings fell off. Using a tomato sauce and a cheese sauce didn’t help either! I’m so bummed. I just made this and it’s complete mush. The only thing I can think of that I did wrong was not drain the zucchini enough. I squeezed and squeezed though. I did everything else any idea what I could have don’t wrong? Is there any water added for the sauce? It isn’t listed in the ingredients but the directions say to bring to a boil? How much water do you use for a “normal” consistency sauce? Excited to try this out!! !